Good afternoon everyone, hope you are well :-) I am here with some transfers I made to celebrate going to see my favourite band, Alkaline Trio. I actually ran into Matt and Derek from trio before the gig and Matt took a photo and posted on his instagram Matt Skiba's instagram. I used my serif software to shrink a heartskull and printed onto plain paper first to check scale as the transfer paper is expensive! I used water slide decal paper in white (as the printer doesnt print white and you obviously need it for the centre of the heartskull) I printed then used varnish to set them over 24 hours. Then you can just use them like normal transfers. Good morning everyone, hope you are well :-) I am here with an altering project for our Easter Showcase at Crafty Ribbons. We have inspiration and prizes for you each day for the holidays and on Monday we have a Bunny Hop so please pop by and join in! For this project I used Chocolate ribbons from Crafty Ribbons and some special glue for fabric as general glues seep through the ribbon and look messy! I covered the handle with 'Keep calm and eat Chocolate' ribbon and on the basket I used a general chocolate sentiments ribbon. I then added polka dot felt to the base of my basket as a lining. Its a simple few additions that really personalise the gift. 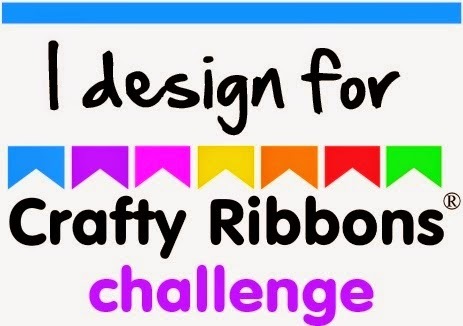 Be sure to pop by Crafty Ribbons and get involved! Good morning everyone, hope you are well :-) I am here with my Anything Goes with Ribbon project for our Crafty Ribbons Challenge. I used their Chocolate Ribbons and some of their buttons on die cut flowers I made from felt to decorate an easter die cut plain felt bag :-) I used special fabric glue to affix the ribbon to the handle, and to put together the felt flower, button and bag. A simple altering project which makes the bag much more personal :-) I would like to enter this into the following challenges: Cutie Pie Challenge: Cute Easter Bunnies or Anything But a Card Altered Eclectics: Anything Goes Everybody Art Challenge: Anything Goes Decorate to Celebrate: Easter Party Decorations Crafting by Designs: Anything Goes Rhedd and Rosies: Anything Goes Thank you for looking and for all your lovely comments! Good morning everyone, hope you are well :-) I am here with midway inspiration for our The Birds and the Bees Challenge at A Little Bit Crafty. I used some fab images and ribbon exclusive to Crafty Ribbons, Cardstock and Papermania Rose Garden papers and sentiment, and I decorated with die cut butterflies.